Going deep with Ultimate Ears' waterproof wonder. At The Master Switch, we have only one response to this: Challenge accepted. After a bit of time on the beach here in Vancouver, we can confirm that while being immersed in water does nothing for the sound of the speaker, it certainly doesn’t stop it playing music. But then, this is a piece of audio kit that can take a lot of punishment. The UE Megaboom is a portable wireless speaker that runs using Bluetooth. It’s a big, chunky cylinder around eight inches long, with a rubbery surface and a tough, curved speaker grill made of what almost feels like a cloth mesh. On one end, you get a power button and a Bluetooth button, and on the other, a hidden headphone jack and USB charging port. There’s a conspicuously-large +/- on the side, which you use to control the volume, and that’s about it. But what a speaker. Outside of the +/-, the design is just outstanding. It can withstand almost anything. Leaving aside the fact that it happily took a wave-based pounding for half and hour and kept on going, we buried it in sand, tossed it to each other, dropped it from height, rolled it along the ground, the works. Our local ski slope was closed for the summer, so we stuck it in the freezer for a while to see how it would handle the cold. No problem. We are almost 100% certain that if we drove a car over it, the car would come off second-best. This is the speaker for people who don’t want to worry about their audio gear, who want to bounce around in the outdoors and let the music play no matter what happens. Bluetooth range is outstanding. While we had one or two split-second close-range interruptions in the month we used the speaker, signal was almost universally full-strength. We got up to forty feet before it started glitching, and up to twenty feet with a couple of walls in the way, which is extremely good. Battery life is terrific - we squeezed fifteen hours of continuous play at 50% volume out of the speaker, no hassle. Setting up the Megaboom to play music is almost absurdly simple, too. UE’s app is fantastic, with a minimalist design that makes setup a breeze. Once you’ve paired your smartphone with the speaker (you can pair two devices, and it’ll remember up to eight), all you need to do is turn on the Bluetooth, and the speaker will respond with a jaunty drum riff. From there, you just play music. It works effortlessly, and its other features are a joy. You can daisy chain speakers together, and give the top of the speaker a hefty whack to change tracks or answer phone calls. There’s an alarm function, and you can turn the speaker on and off remotely. Even the charging cable makes us smile: it’s a bright, neon yellow, for no apparent reason. We love it. It’s clear that UE not only want you to use the speaker in as many situations as possible, but take immense pleasure in doing so. It’s amazing that such a simple set of features can create such joy. Of course, no speaker is perfect. There’s a big ‘but’ coming, and here it is: we wish the sound was a little bit better. Well, okay, we kind of lied. It’s not a big but. It’s a small one. The sound is perfectly acceptable, with groovy bass and crisp highs, able to handle multiple different genres and styles without breaking a sweat. The two 2-inch drivers and twin passive bass radiators do a very decent job, and overall the quality is perfectly acceptable. It’s a very solid 8/10. Problem is, with a speaker that goes so far to please, we sort of expected a little more than just ‘solid’. While the audio is fine, it has a boxed-in quality that seems to pull back the details of the music, shaving off the nuances and constraining the sound from really letting loose. How much this matters to you depends entirely on what you’re using the speaker for, but audiophile-quality this is not. Even the in-app EQ, while easy to use, doesn’t have the quality or fine-grained control we wished it had. What the speaker can do is go extremely loud, which if we’re being honest, is what’s important here. When you’re using a speaker out of doors, you need as much volume as you can handle, and the Megaboom manages to push out up to 90dB, which is very loud indeed. And we should say right here and now that call quality is absolutely fantastic, with crystal-clear audio and flawless performance. If you can handle slightly-less-than-perfect sound quality, then you’ve got almost nothing to complain about here. The UE Megaboom is an absolutely phenomenal little speaker, and despite the slightly inflated price-tag ($250), we think it’s absolutely worth it. 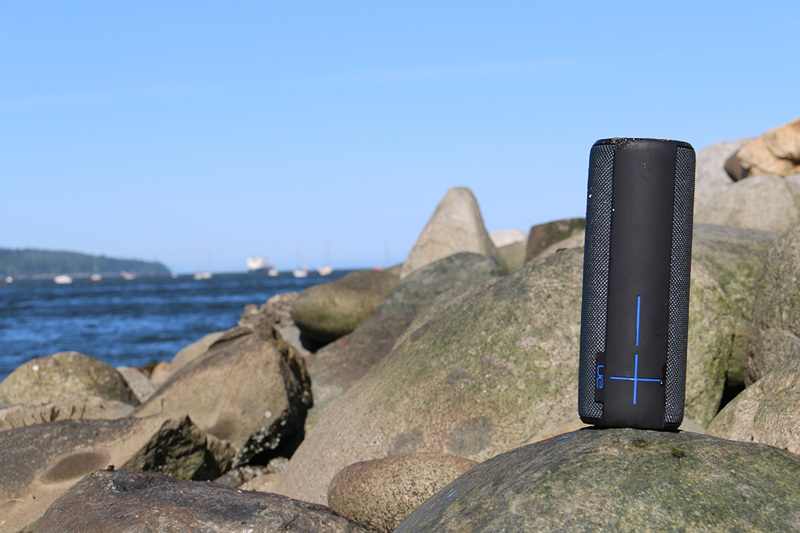 If you enjoy taking your music to the park, the beach or the mountains, then the Megaboom goes from a nice-to-have to essential. You gotta try one. And as a gory bonus: while we were shooting these photos, our photographer was backing up in the waves, and bashed his foot against a sharp, barnacle-covered rock. Never let it be said that we don’t bleed for what we do. Fortunately, no stitches were required. Rugged design, ease of use. Sound could be a little better. Anyone who likes playing music outdoors. A big, heavy monster of a speaker that combines stylish looks with a tough exterior, like The Rock in a ballgown. It’s cheaper than the Megaboom, too, although it isn’t quite as convenient to use. Like the UE model, it’s entirely waterproof. The Megaboom’s uglier cousin, that trades looks for an even more rugged design and the ability to be kicked about without consequence. Similar functionality all-round, although we think the Megaboom has much better sound quality.